We've just been to the latest show, From The Ground Up, of Circus Oz in their tent at Birrarung Marr. 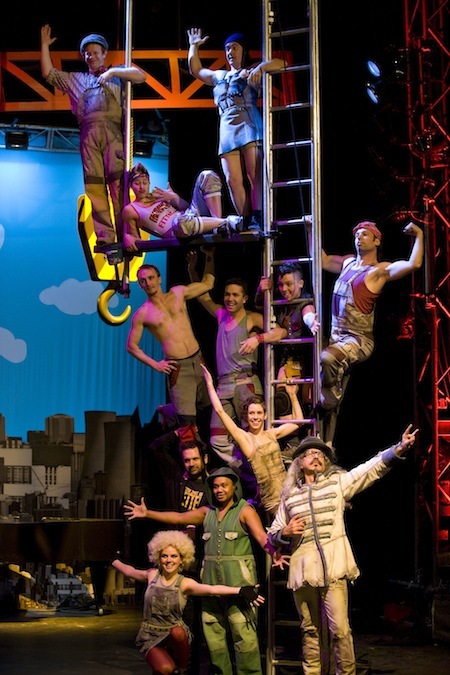 Circuz Oz is our Melbourne circus - it is crazy, quirky, pure fun, wit and celebration! It performs in Melbourne in its traditional tent at Birrarung Marr. It is in your face entertainment that takes the concept of circus beyond tradition... but sorry to say no animals or typical routines. It is much more than a circus and engages any age group. I went with my 12-year-old son, and the two of us thoroughly enjoyed every single moment of it. There are death defying stunts and amazing acrobatics, hilarious comedic skits, physical theatre, live music and ridiculous exuberance. 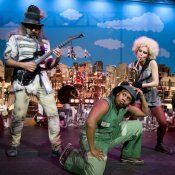 Each performer contributes his or her own eccentric character and personality to the show, and you end up feeling quite at home inside their crazy make-believe world. The performance is real, gutsy and playful. It goes far beyond entertainment. 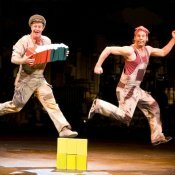 Circus Oz is involved during and beyond their shows in bringing out human creativity and exuberance, that is inclusive of all. We particularly liked the comedy, which takes the cliches of circus, magic or clown shows to another level. Their clever song choices make the ordinary really quite extraordinary and take it beyond the expected circus performance. There is the escape-out-of-a-locked-box trick that had us wondering how that could have happened, flying acrobatics on teeterboard and trapeze and more. The theme of this year's performance is 'From the Ground Up', which tells the story of their new building in Collingwood which is currently being constructed and will replace their current Port Melbourne home space in 2013. This will be a purposely-designed community, workshop and circus space that will give a permanent home to the Circus Oz' great community spirit and activities. They are actively forwarding the asylum seeker cause and actively support indigenous communities, cultural diversity. A future that has everyone in it, with a good time for all. They run activities for kids, circus internships for indigenous people, make their shows available to people not normally able to afford to see them, are actively creating community and even run team building workshops for business. Impressive thing about it is that they've been all around the world as well as small outback towns and wayward communities.